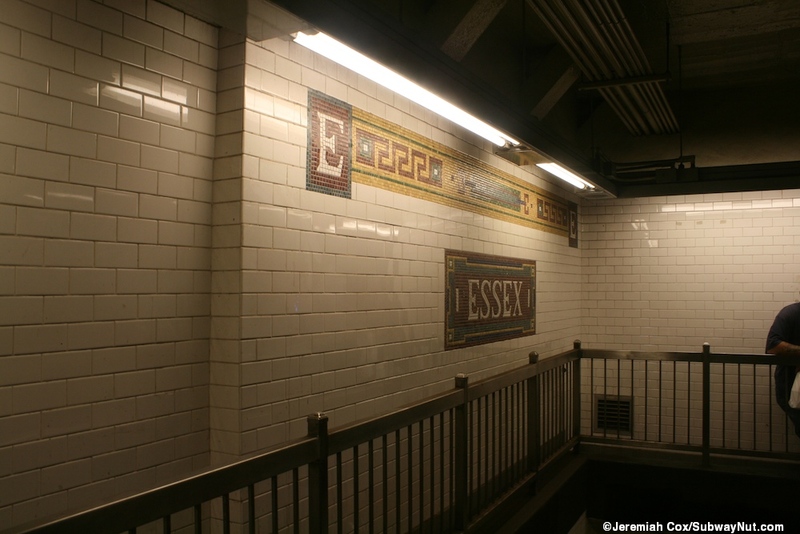 Essex Street is the BMT subway station at the foot of the Williamsburg Bridge that opened in 1908 and the station has a unique layout with 3 tracks and two platforms on the northern edge of the abandoned underground Essex Street Trolley Terminal that once served the turning loops of streetcars going over the bridge. The station is just beneath the surface. 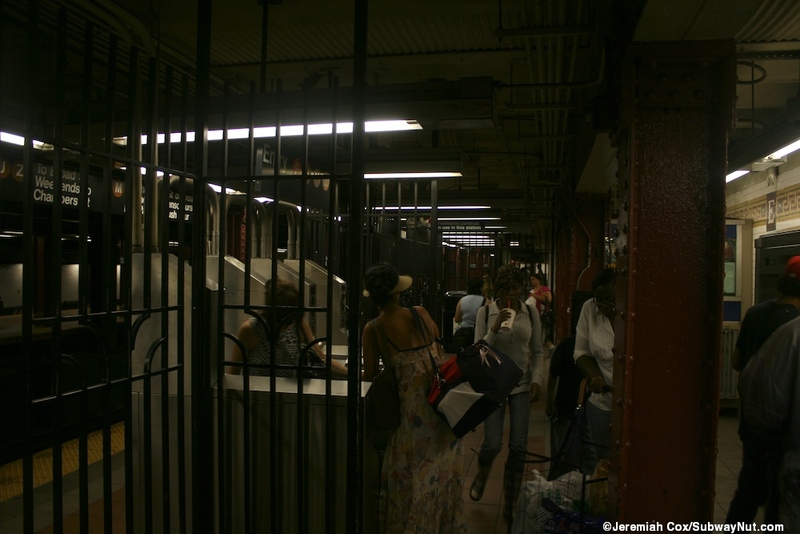 The Trolley Terminal has largely survived intact with only a tiny portion turned into subway storerooms as a large and relatively well lit underground space. 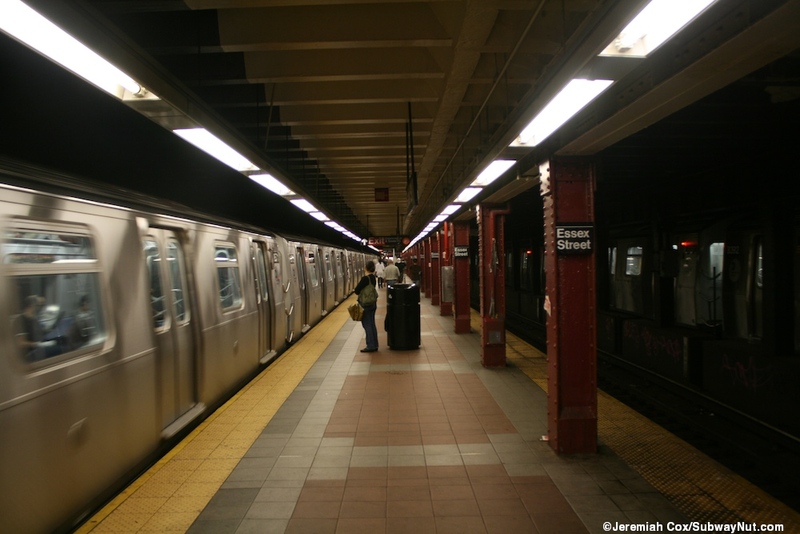 The MTA is currently assessing proposals for alternative non-transportation uses inside of it. 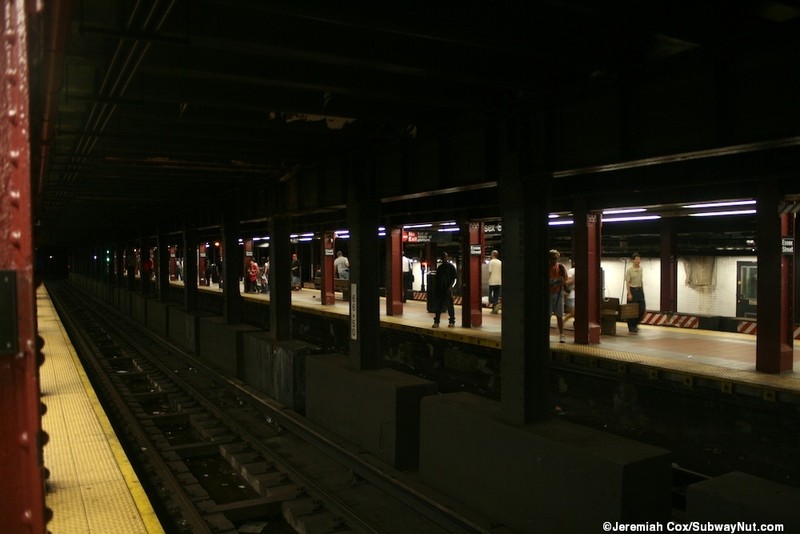 The subway platform layout is a single north track and side platform used by trains coming off of the Williamsburg Bridge. 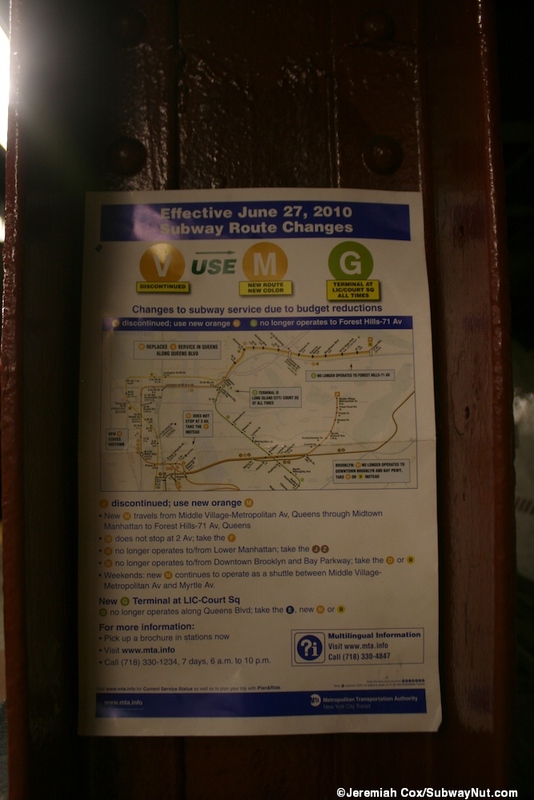 Since the combination of the M/V via the Crystie Street Connection in 2010 this platform has the not-quite-right looking signs for Uptown M | Downtown J/Z. 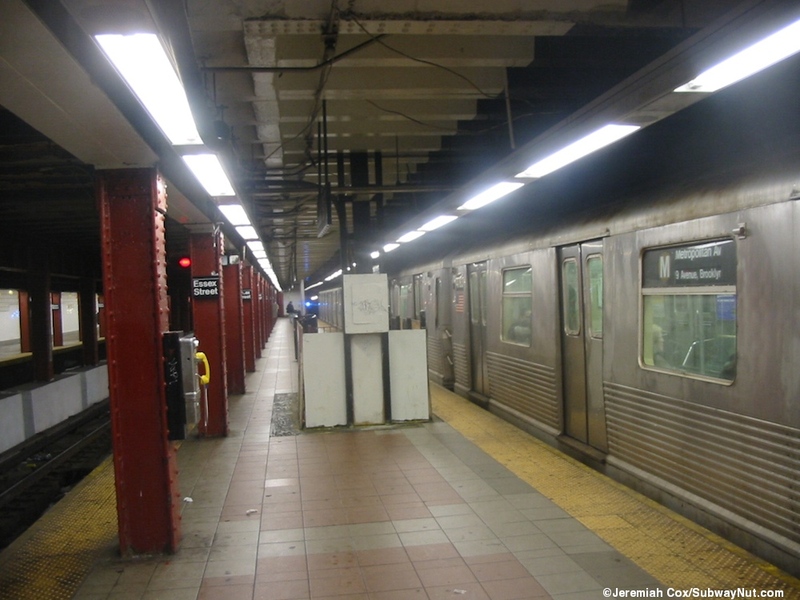 The island platform has two tracks and is used by all trains going over the Williamsburg Bridge. 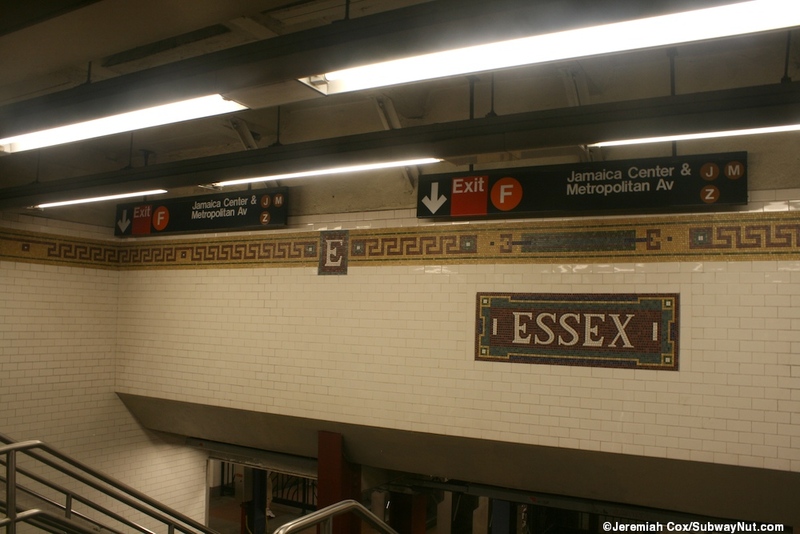 Since the former northbound tracks in the Centre Street Subway were closed in 2004 all J/Z trains stop on the middle track. 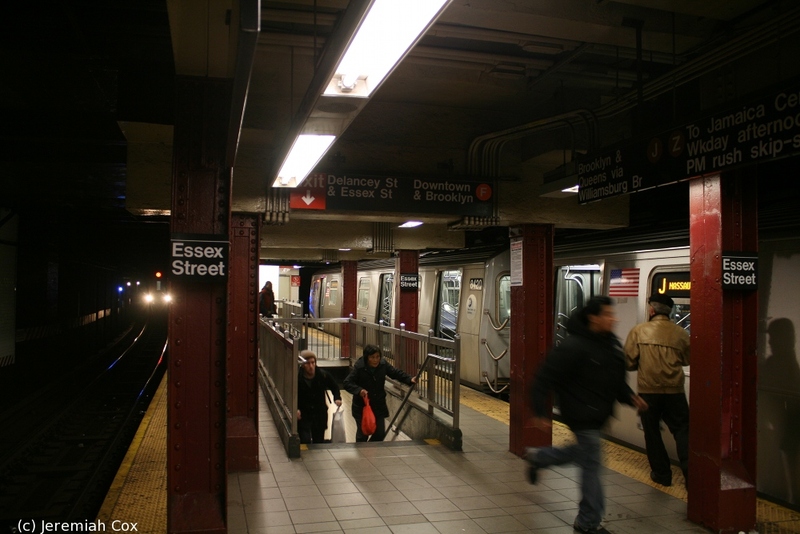 M trains, coming from the 6th Avenue line via the Chrystie Street connection halve to use the wall tracks from their flying junction entrance (even though their coming from farther north) and take a different route (following Crystie Street along the B,D express tracks) completely away from the 2 Avenue Station F trains stop. 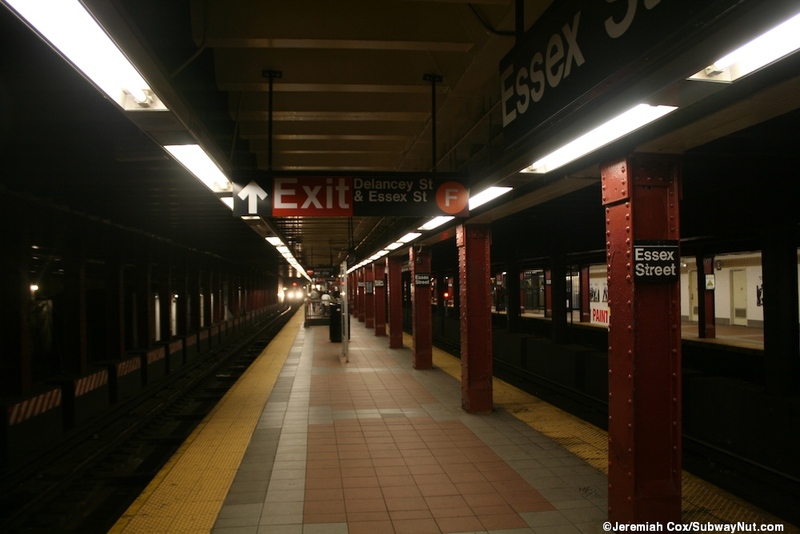 Brooklyn-bound M and J/Z trains sometimes make cross-platform transfers at Essex Street but since the Williamsburg Bridge only has two tracks one train must always leave first. 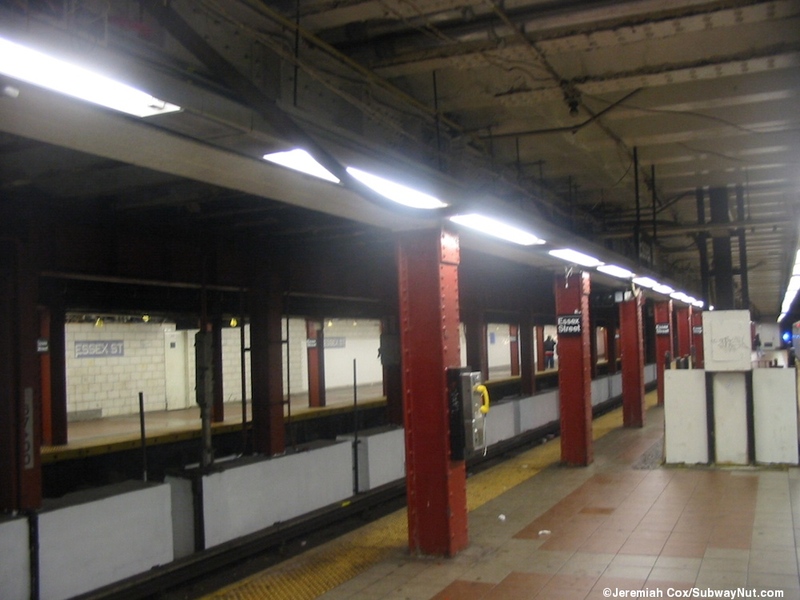 The IND F train's Delaney Street station is just beneath the eastern end of the platforms. 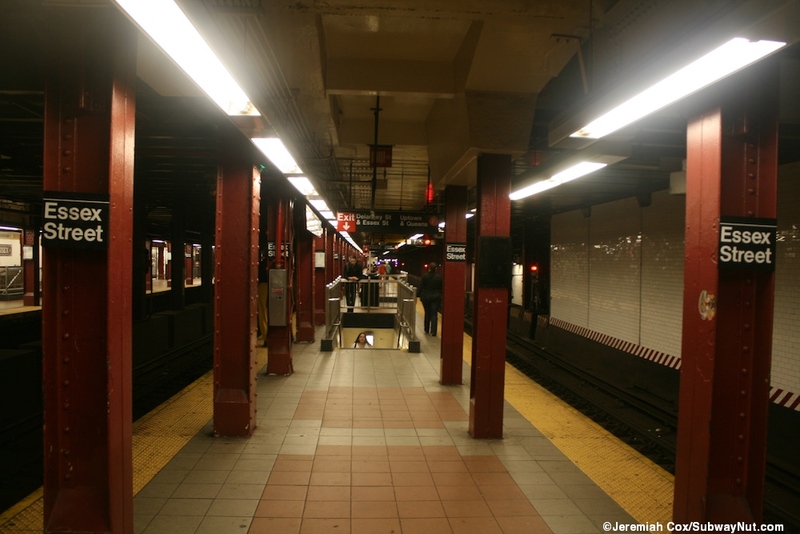 All access to Williamsburg Bridge-bound island platform is via the lower-level F platforms that act as an underpass, but have very wide central areas so passengers can leave the J/M/Z platform and not be interspersed with passengers waiting and boarding F trains. 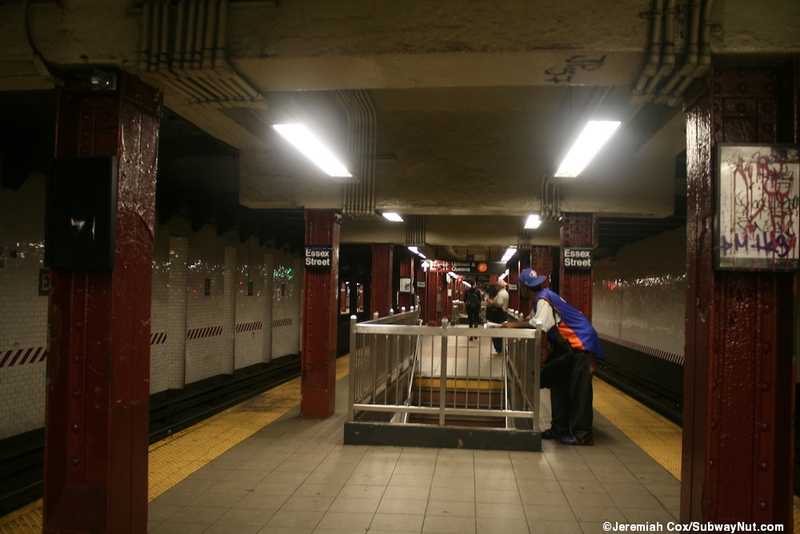 This platform is quite narrow with a single line of columns along the middle J/Z track. Towards the eastern end of the platform is a closed emergency exit staircase that leads downstairs. At the western end is where the only exits are. 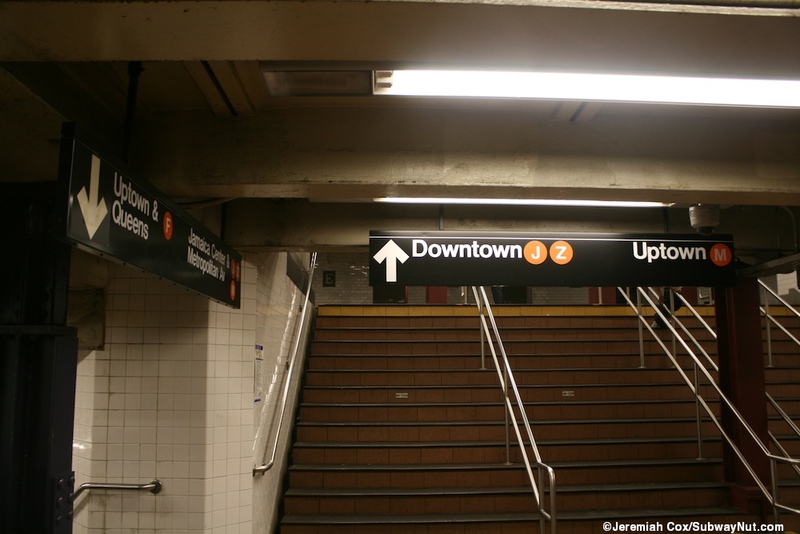 There are two staircases down to the Uptown F platform, followed by 2 down to the Downtown platform at its extreme western end. At this area are signs that say "Do Not Wait Here" with arrows to try and funnel passengers towards the front of the narrow platform. The platform lacks a wall except at its western end allowing a view into the abandoned trolley terminal beyond. 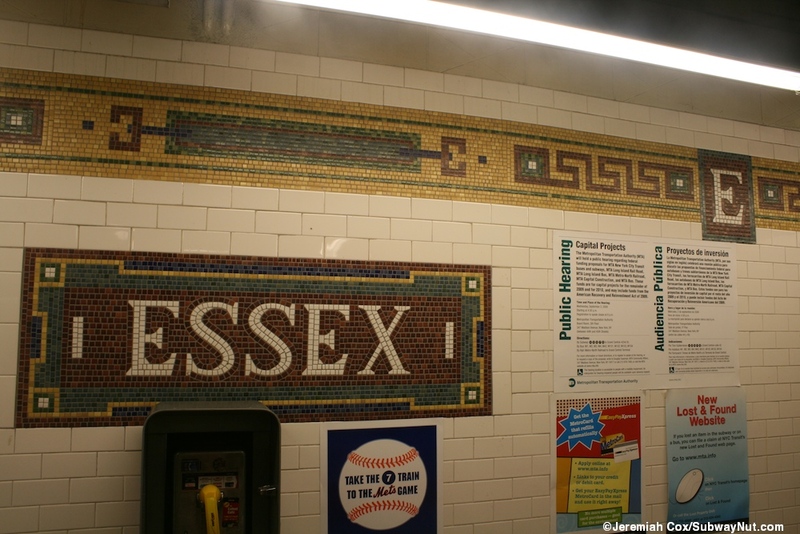 The Downtown J/Z, Uptown M side platform has the usual tiled walls that were redone with renovations in 2004. The walls have a golden trimline with accents of green and brown. There are little Es on a brown background. Small name tablets (including one vertically) are beneath this trimline. These are similar to the little Es with brown backgrounds and gold and green borders. It has its own exit along the exact middle of the platform. Here is a narrow fare control area with a token booth and two separate sets of turnstiles. 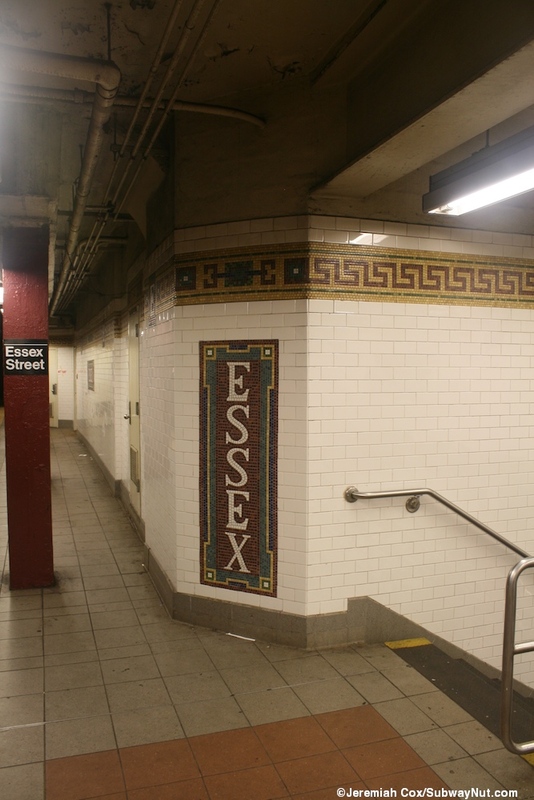 It leads out to two streetstairs: one to the NE corner of Essex and Norfolk Streets, and one near the NW corner slightly down the Essex Street block. 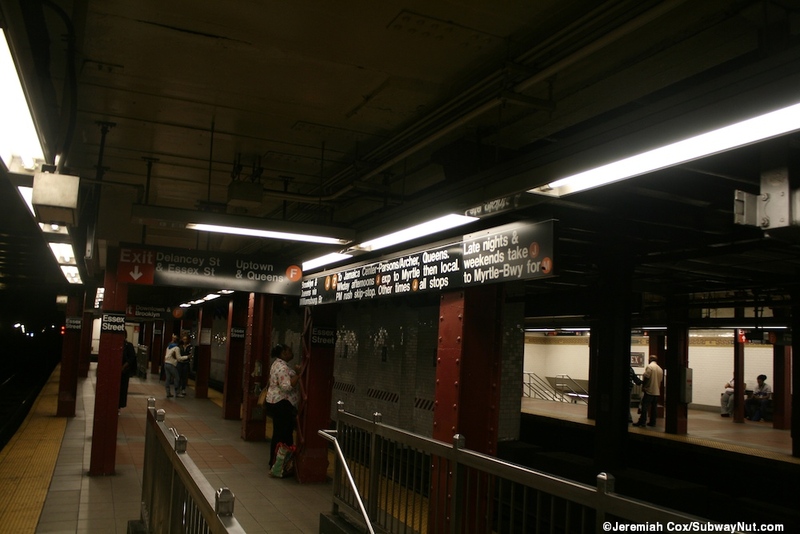 At the eastern end of the platform is a staircase directly down to the Uptown F platform. 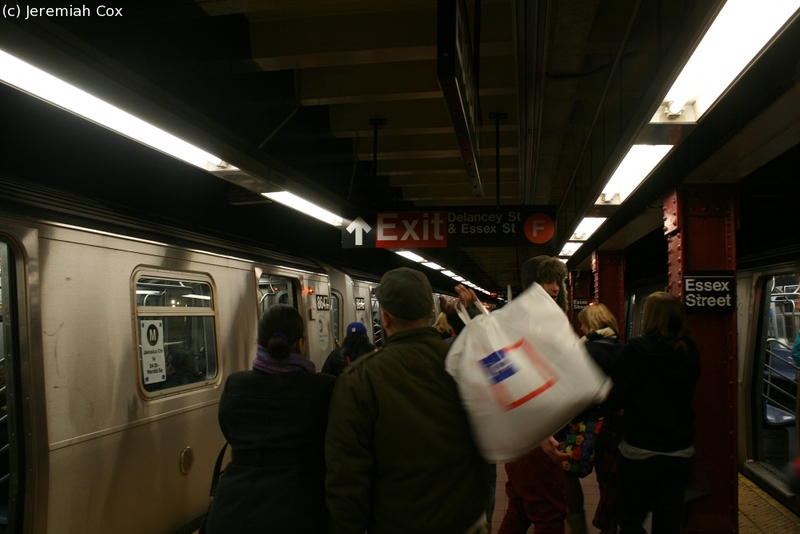 Passengers wanting stations along Sixth Avenue and not caring if they catch the F or the M train have a habit of standing on the staircase so they can see whichever train comes first and rush up or down to the respective platform. 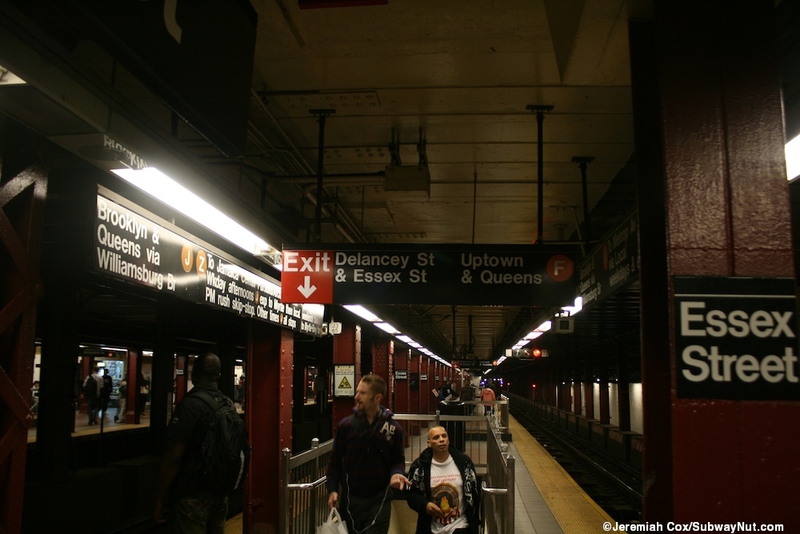 This is followed by a very wide staircase that leads down to a shared fare control area with the F train (see the Delancey Street page for photos and full information) and a staircase down to the Uptown and Downtown F side platforms. 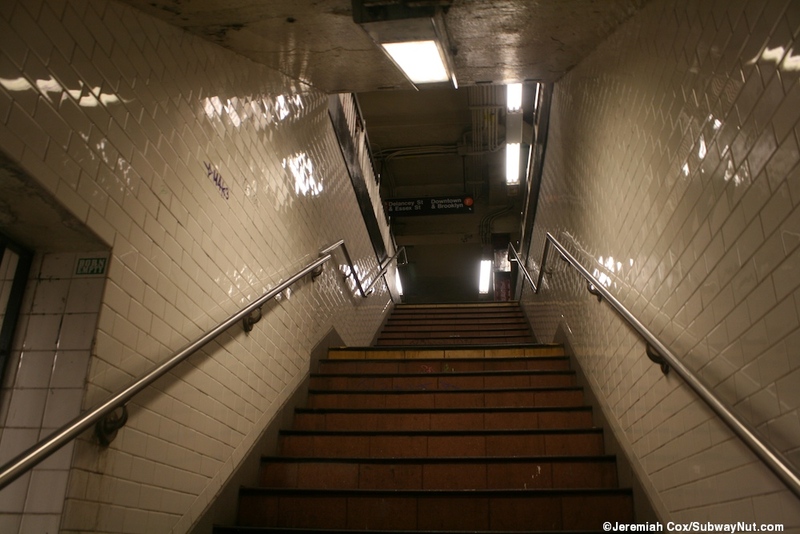 The wide staircase down to the Delancey Street fare control area beneath the E trimilne and name tablet. 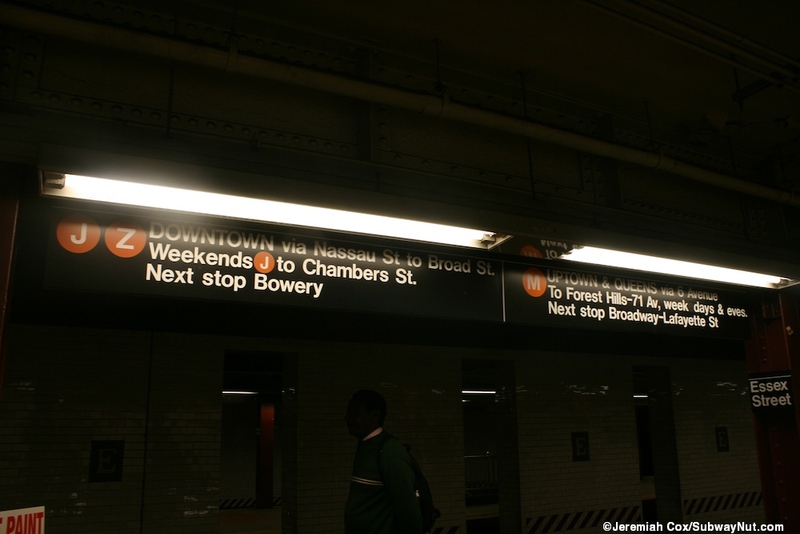 Uptown & Queens F or Downtown J/Z and Uptown M?